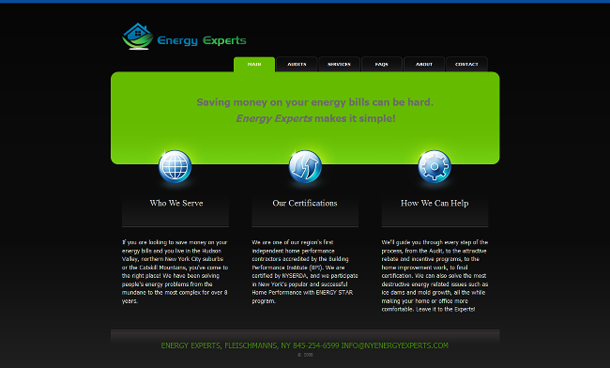 The owners of www.nyenergyexperts.com (which later went offline in March 2015) asked me to customize and modify their website template and install and format their written content and imagery, including an embedded video and an embedded .pdf document. The video, which was in Windows Media Video (.wmv) format, and the PDF document were not visible on all Apple® Mac computers, so I added notes to the www.nyenergyexperts.com website advising Mac users to download and install the free Flip4Mac QuickTime video component from Microsoft and the “PDF Plugin for Firefox on Mac OS X” from addons.mozilla.org. The site owners also had me edit their contact form so that it accesses their hosting provider’s PHP form mailer, and I also added additional data fields (“Year house was built,” “Utility and fuel company,” etc.) to the form.